We actually shot the entire thing out of order because that's just how the schedules worked out. 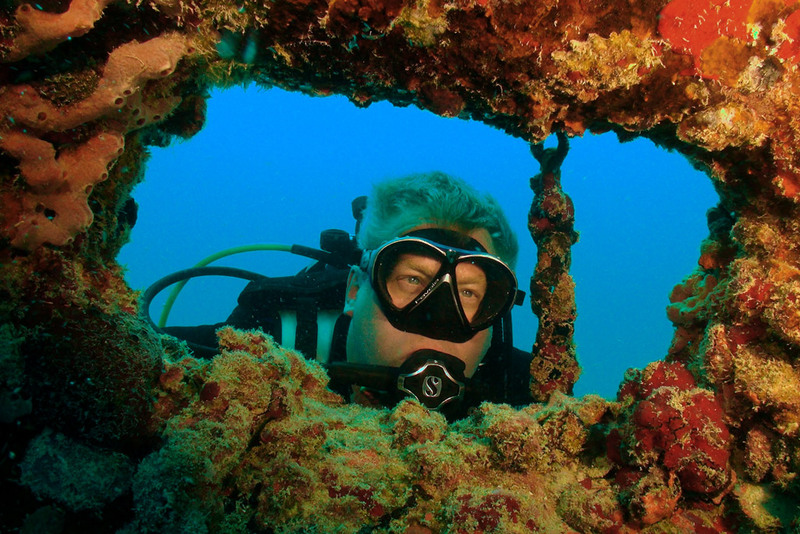 We started on Key Largo diving with Horizon Divers. Our first day out was to shoot the Duane and it was rough. Even though Horizon Divers has a nice big, stable catamaran, we were rolling around. There were quite a few people seasick on the boat. And poor Editor Tim (who was our surface cameraman) was stuck on that boat all day, while at least Cameraman Tim and I got to dive, to get off the boat for a couple hours. 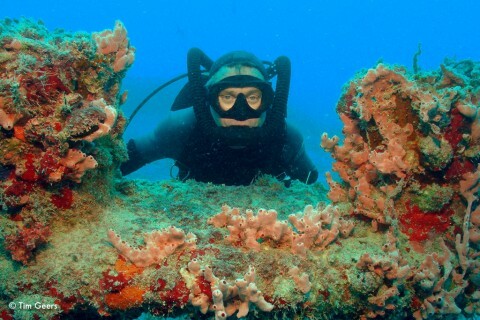 Unfortunately, once we hit the water, we discovered a ripping current and not the greatest underwater visibility. The Duane was as beautiful as always, especially the marine growth inside the bridge. When we got back to the boat, the divemaster seemed genuinely impressed that Tim and I were able to complete a dive with such large cameras in a current that was so strong that you literally needed to cling to the mooring line and pull yourself down to the wreck hand over hand. My hands were sore that night! The next day we did it all over again, except on the wreck of the Spiegel Grove. Fortunately, conditions had improved overnight. The sea was calm, the sun came out and the current, while still present, had died back to a much more manageable level. Unfortunately, the visibility had not improved, holding at about 50 feet--certainly workable, but not ideal for shipwreck photography. The following day started early. We had a nearly three hour drive to Key West before the boat left the dock at 8:30 with Southpoint Divers. We were up at 4 AM and on our way by 5 AM. If we thought conditions were bad on the Duane, we quickly learned how they could be worse! Nearly half the people on the boat were unable to dive in the sea conditions off Key West. People were sick everywhere. 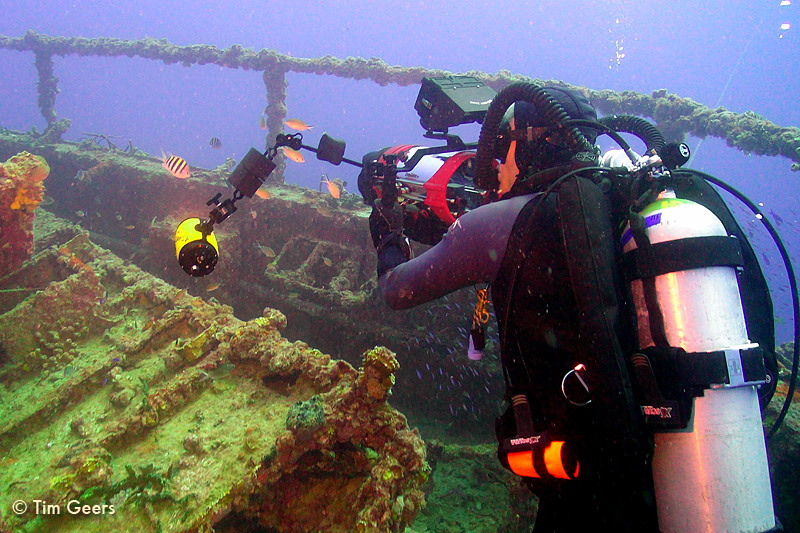 Yet Editor Tim braced himself on the rolling boat and shot surface footage like an old sea salt! Cameraman Tim and I hit the water and just looked at each other with that look of "you have to be kidding me." The current was actually stronger than it was on the Duane! It took six minutes just to get down the mooring line to the Vandenberg! Once we hit the deck and hid out of the current behind the superstructure, we started shooting in what could be described as New England visibility (at best, 30 feet). We got the shots we needed—barely. 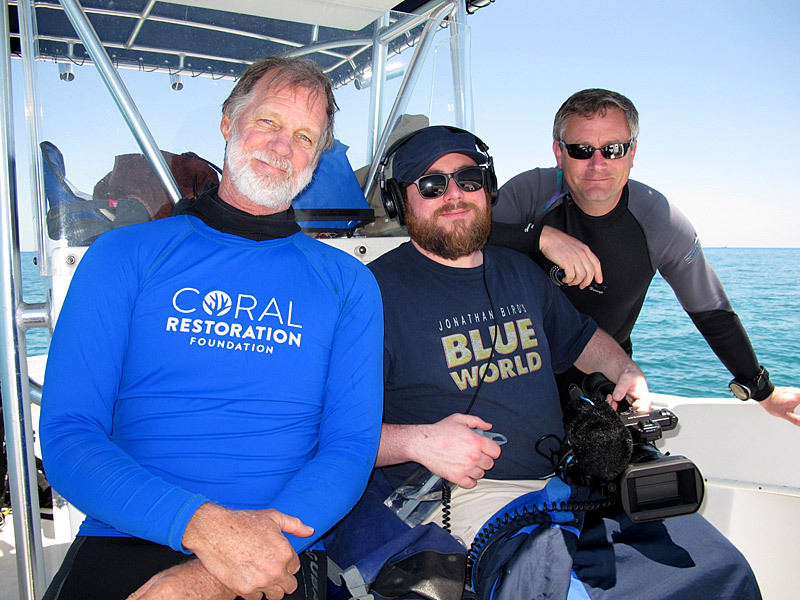 On our last day, we arranged to visit Ken Nedimyer and his Coral Restoration Foundation in Tavernier just south of Key Largo. 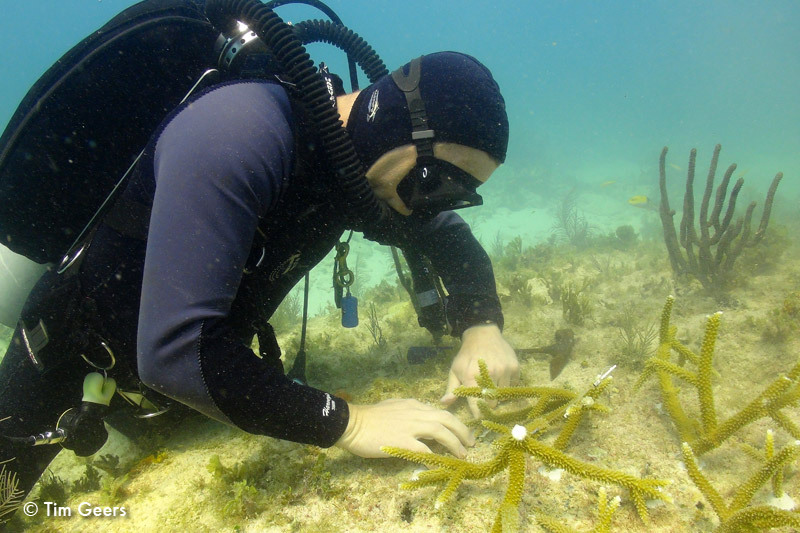 Ken has been working on technology to "farm" staghorn and elkhorn coral for many years. 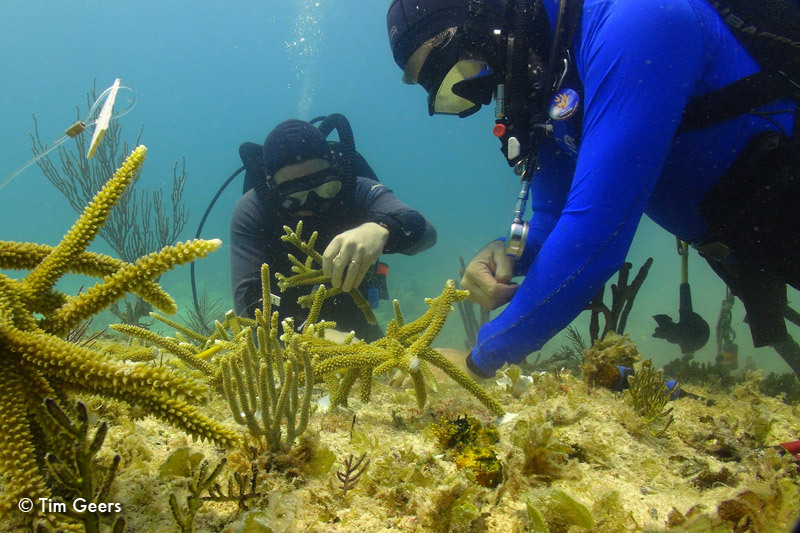 These corals have been nearly wiped out in the Keys from various diseases and afflictions. But Ken figured out how to replicate them and grow them quickly in his underwater farm just offshore! 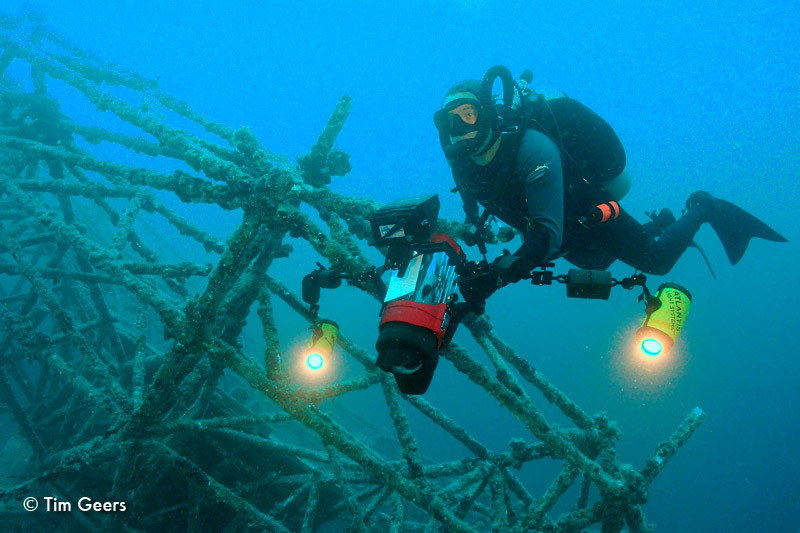 And it might be no surprise that running an underwater farm is a lot of work. Ken needs all the help he can get—so he put me to work for the day. It was really interesting and lots of fun. 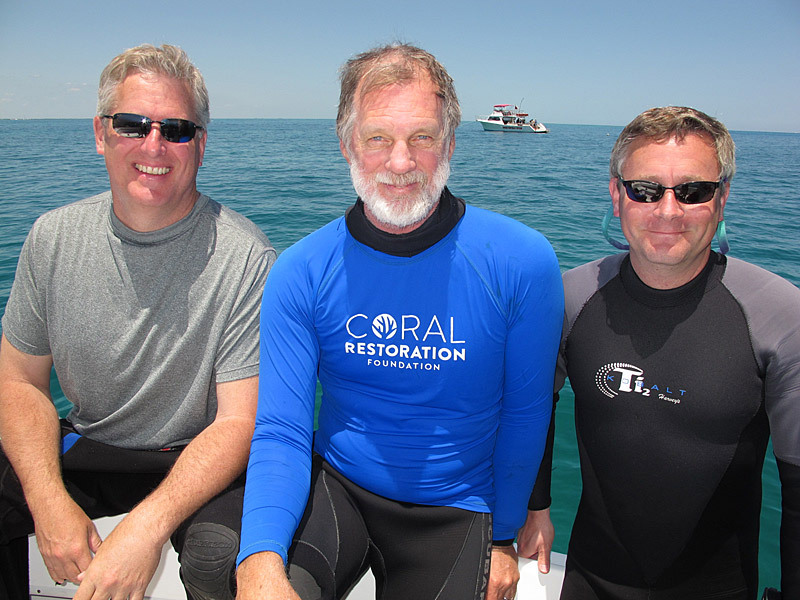 (I strongly encourage any divers visiting the keys to go out and volunteer with him for a day—he will appreciate the help and you will have some of the most fascinating dives of your life). I can proudly say that I helped "plant" a new section of reef, as well as clean, maintain and propagate some coral in the farm. I'm still jazzed about it. I get to do really cool stuff. How great is this job? I can honestly say that season 4 is going to be the best yet. We just keep finding great new things to investigate, adventures to have, and stories to tell! More adventures to come…keep watching here!